The British public have long been into their festivals, from the early days of classical and folk music to hippy and rock affairs such as The Isle Of Wight and Glastonbury. Here is a brief summary of some popular UK festivals. Glastonbury is the largest greenfield music and performing arts festival in the world and attracts some of the biggest names in the music industry. It is a popular event which first formed in 1970 and has since gone from strength to strength. Many different stages and tents cover all genres of music, from rock to reggae, dance to folk, all tastes are catered for. There is live T.V. coverage and the entire area becomes a medium sized city of around 130 thousand people with it’s own police force, medical staff and food markets.. you will have to use your imagination for description of the toilets. The event takes place towards the end of June in Glastonbury, England. Close on Glastonbury’s heels is the V Festival which is currently held simultaneously at two sites – Hylands Park in Chelmsford, Essex and Weston Park in Stafford, Staffordshire. 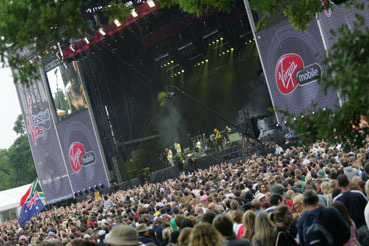 The festival is run by the Virgin organisation and takes place over the penultimate weekend of August. V is primarily aimed at an indie rock audience and some people regard it as a “bit posh”. The Isle Of White festival sells around 50 thousand tickets and takes place at Newport on the Isle Of White just off the south coast of England. 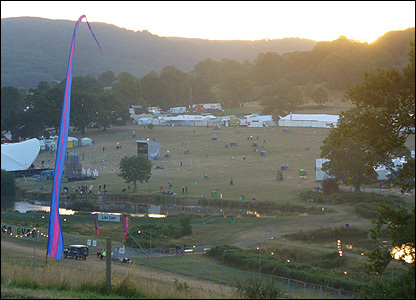 The festival inspired such events as Glastonbury and first took place in the psychedelic 60’s. Early legendary acts to play include the likes of Jimi Hendrix (who made his first UK appearnace there), Bob Dylan, The Who and The Doors who all had to catch the sea ferry over to the Island. The event takes place during early to mid June and recent line ups include stars such as The Rolling Stones, Roxy Music and REM. Considered my some to be the next best music festival after Glastonbury. 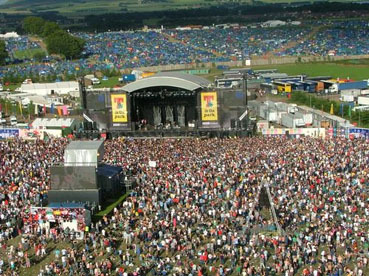 Set near to Perth and Kinross, Scotland, the 2007 “T In The Park” event has sold 40 thousand tickets in February even though the event doesn’t take place until early July. 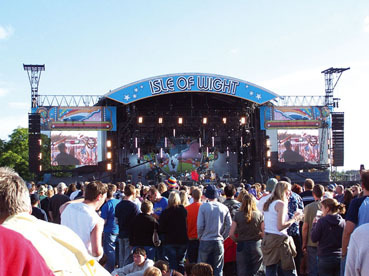 Many renowned music acts play this festival with 2007 line up including the Arctic Monkeys, Mika, Rufus Wainwright, Interpol, Scissor Sisters and Lily Allen. Some call it the Glastonbury of Scotland and it is set in beautiful countryside surroundings. 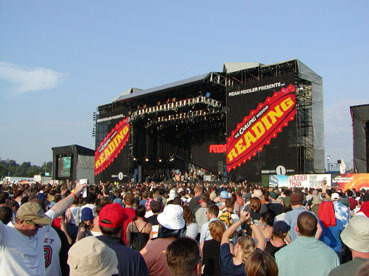 Formerly known as the Reading Festival, The Carling Weekend boasts a similar history to events such as Glastonbury. Great tunesmiths to have played include Nirvana, The Stone Roses and The White Stripes all adding to the events reputation. Mean Fiddler, ensures that since the event has been twinned with a Leeds version, fashionable indie types make up much of the audience with an emphasis on modern rock and Indie. Band lined up for the August bank holiday weekend include Smashing Pumpkins, The Horrors, Kings Of Leon and Razorlight. One of the largest heavy metal and rock festivals in Europe is the Download Festival which takes place at Donnington Park, near Derby. The festival takes place during early June and also appreciates T.V. coverage. This event is popular with heavy metal maniacs. For dance music enthusiasts there is the legendary Global Gathering event. With an enormous 75 thousand revellers in 2006 and full coverage in the BBC this has to be one of the most renowned dance music events in the world. From Fat Boy Slim to Groove Armada, Faithless to Basement Jaxx, even the Red Arrows air display team are now listed as an attraction. Global Gathering takes place at Long Marston, Warwickshire during late July. Expect strange hairdos, furry boots and lots of whistles. Some of the more eclectic festivals worth considering include: Latitude which features rather lesser known indie rock bands and takes place in Henham Park, Suffolk in mid July, long established dance event The Big Chill at Eastnor Castle in Malvern (early August), Bestival which takes place at on the Isle Of Wight in early September and is curated by BBC funk and electronica DJ Rob ‘Da Bank’. The alternatively folksy Green Man Festival takes place in the Brecon Beacons in mid August and the psychedelic Moseley Folk Festival in Birmingham is set amongst the landscape that inspired Tolkien and takes place early September. For anybody not familiar with British weather, put it like this… the great Caesar of Rome visited these shores once and didn’t return. From John o’Groats to Lands end, the weather is totally unpredictable, sometimes not even the Met office know whats going on and for this reason the best advice is to be prepared for the worst. Make sure you don’t camp too close to toilets for obvious reasons, if you would like at least one nights decent sleep then keep away from generators or anything that could be a distraction, pitching a tent next to a hedge can sometimes be a mistake as hedgerows can become midnight urinals at certain events. A pair of wellies, hat, poncho or rain mac, a cooler box and a few drink and food provisions (preferably stored in the car) would be worth a thought as well as sleeping mats and a bum bag or small rucksack to keep the essentials in, but make sure they fit comfortably. On the rare occasion the sun decides to “shine on” be sure to have adequate sun cream to avoid ending up looking like a beetroot ready for pickling. Never leave valuables in your tent, even the safest of events will attract tent burglars.